"...For a lot of people, if they can't see where they are going, it is often pretty inconvenient to get out to the optometrist for a new pair of specs... our customers are everywhere, from building sites, marae, hospitals and resthomes, through to anybody's living room, you get to go all over the place, and wherever you go people can generally see more clearly when you leave, it's great..."
Store Manager Keith B. talks about the mobile Optometrist side of his business. The EyeLove EyeCare Mobile Optometrist is a classic example of how with a little kiwi ingenuity, the simple act of helping out a neighbour turned into a bustling little practice. A few years ago, our Panmure EyeLove EyeCare clinic received a distress call from a local rest-home. One of the residents had taken a fall and broken his glasses, depriving him of his last remaining joy (doing the crossword in the daily paper). His fall had also rendered him bedridden for the time being, so there was no getting out to see us. Optometry equipment is typically heavy and bulky, so despite the rest-home and the clinic being practically neighbours, it presented a slight problem for us to lug various pieces of vision measuring machinery up the road just for a single eye consultation. However, after some careful testing and planning, we were able to strip the equipment list down to bare essentials, and still be able to provide excellent and thoroughly accurate prescriptions and eye health examinations. We packed what we needed into a little car, and paid him a visit. He was rapt, and was back on the crosswords the same week. The resthome called back not long after, asking if we could perform eye sight tests for a few more residents. 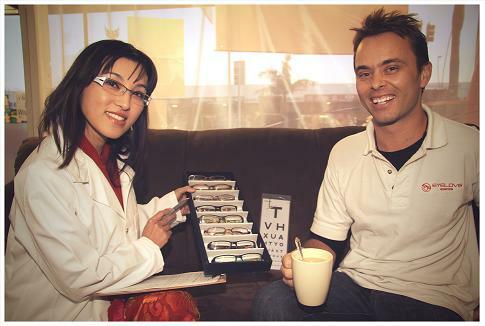 Once we saw there was a genuine need for a mobile unit with a fully qualified optometrist in the community we began it as a secondary practice, and it grew from there. Fortunately, new technology has now slimmed down the once bulky apparatus and today we bring what is practically a full clinic along with us whenever we make a visit. Q How much space is required to perform an eye examination? A A room with 3 metres distance is required for the visual acuity test (a standard eye sight test). Q Do you offer discounts for Super Gold Card holders? A Yes we do – please enquire to see what our latest special is. Q Can you prepare quotations for WINZ? A Yes we do this regularly. Q Do you offer any discount for children? A YES we do, and where the parent guardian or child has a valid community services card, each child aged 15 years or younger is likely to be eligible for a $287.50(incl gst) subsidy, with a further $51.11 (incl gst) available if adult frames are required, so be sure to let us know if you have a valid community services card. Q Is the Optometrist nice? A Our staff are selected for their combination of warm friendly sociable personalities, compassionate nature, and most importantly thorough experience and expertise in the field of optometry, (Yes she's lovely). Q How long till you get the glasses? A Although production time varies depending on the complexity of your lens requirements, you can expect a finished product delivered within 10-15 working days. In many cases much faster. Contact lenses typically take 3 working days. Q How long does an eye exam take? A A full eye exam will typically last 30-45 minutes, including a thorough check of eye health. How long you spend choosing frames is up to you. Q Do you have a clinic we can visit? A Yes, we currently have a practice in Panmure with our own lens edging facilities, repair workshop, and a broad range of optical prescription frames and sunglasses on display. Please feel free to pop in and visit us. Q Do you do repairs? A Yes, we have a workshop, technician, and access to further facilities if things are really bad. You can either drop your damaged frame into us, or post it (with a return address and contact details if you want it back). The optician is not there every day, and some repairs will be done overnight, so bring a spare pair if you have one. Q Is there parking at your Panmure clinic? A There is plenty of parking on the road outside, with two disabled parks right out front, and ample parking around back, right beside the Panmure Library.